Fast and powerful, rugged and reliable, Shaver post drivers are the world's finest. They're built for heavier than the job requires. With only six moving parts, these machines perform year after year without a breakdown. You can choose from five models of Shaver post drivers. All models take just a few minutes to mount or detach. All work with any 3-point hitch, with or without Quick-Tach. 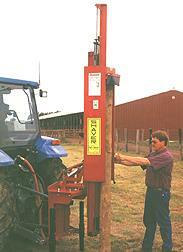 Shaver post drivers can be mounted on tractors or skid steer loaders. Drives posts straight and true on almost any terrain. Drives a four to five inch post in 10-15 seconds. Drives steel, wood, or even railroad tie. Only 6 moving parts ensure long machine life. 30,000 to 100,000 pounds of impact; front or rear mounting. All these features yet affordably priced. Shaver Model HD-12 "The Brute"
Shaver Model HD-10 "The Workhorse"
Shaver Manufacturing has unveiled their newest addition to their lineup of top-quality post-drivers. The new OH-100 is designed for operators who need a amounting and self-contained unit that is powerful, easy to maneuver and requires minimal hydraulic power. The new skid-steer loader-mounted post-driver is specially designed for farmers, contractors, ranchers, landscapers and maintenance departments looking for a simple, economical and efficient solutions to installing steel or wood fence posts. Powered by a minimum of 10 gpm, the OH-100 can drive a 4-5 inch post into the ground in less than 15 seconds and has the power to drive even railroad ties. The OH-100 unit can easily be maneuvered around buildings, storage sheds, trees and other obstacles. When mounting the unit to the front of a skid steer, secure the unit with the fast-tach bracket, then only two remote hydraulic hookups are required. As the machine drives the posts, oil is pumped through the hookups from the post drivers own 5-gallon oil reservoir.